I would totally buy another candle just for the appeal of the tin and smell of it alone. My friends commented on the fruity smell it, and wanted one of their own. This candle makes a great gift for any occassion really, but isn't very ideal for edible massages. The candle filled my room with a lovely light scent of watermelon, and gave off the perfect amount of glow to give my room just the right lighting I needed to set the mood. The tin and candle measured about 4.5 inches wide and stood at about an inch high. The tin also included a mini plastic spoon to drizzle the wax easily over your target. As for the quality of candle itself, I would have to say that the wax was a bit oily for massages, and was quite messy to clean off the sheets after use. The wax didn't get very warm, and didn't dry when applied to the body. The watermelon scent was pleasant, and easy to detect its flavor when lit. The wax had the slightest hint of flavoring which was good to devour from my lover, but not as exciting to use for massage. I would recommend this product more so for its lovely scent and cute design rather than purchasing it for its intended use. It definately gives your setting that boost to set the right mood. 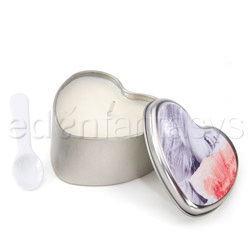 The heart shaped tin is perfect for that feminine flare a girl wants in her room. The wick burns nicely and the candle lasts for multiple uses, and long periods of time. The candle can be easily stored in small drawer, or even left out on a shelf or table for looks. This candle lasted about as long as a candle of this sort would if used for about 3 hours a night for a about a week. The scent remains the same throughout use, but the wax can become sort of gooey and oily when mixed about. I much prefer using this candle as an actual candle, for the ambience and aroma. Would make a wonderful bridesmaid or bachelorette gift bag idea.. I like our suntouched (we got the cherry flavor/scent) but ours hads a bit of a problem with changing colors and not burning evenly. Still I love the fact that the wax can melt at body temperature and makes a great moisturizer for elbows and heels! I am really looking forward to smelling this candle! I have read nothing but how amazing the smell is..YuMMy! Upset Stomach from a candle? #AskEden - Suntouched Edible Candles-5lbs!? Thank you for viewing Suntouched edible candles – oil review page!